Most people eat only the juicy flesh inside of the watermelon. However, watermelon rind is completely edible. And the benefits of watermelon rind juice is outstanding! Watermelon rind is beneficial for your body in many ways. In fact, 95 percent of the nutrient value of a watermelon is in the rind! Watermelon juice is beneficial for breaking down kidney stones. 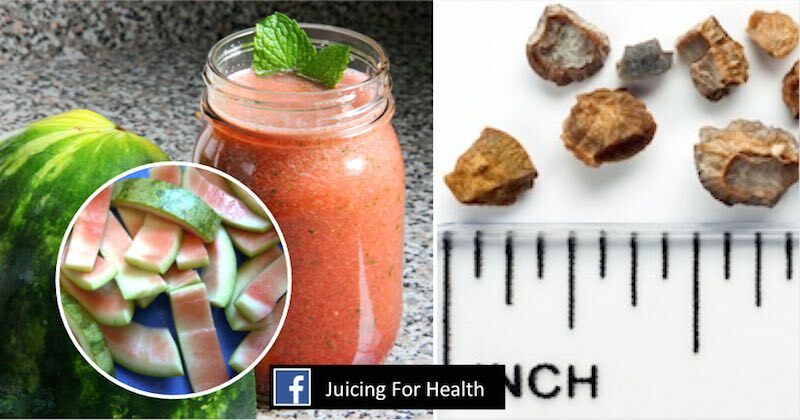 Readers have shared with me about how they drink jumbo glasses of watermelon juice daily to break down kidney stones that get eliminated more easily by urination. I received this beautiful story from a reader that explains how he has successfully used watermelon rind juice to eliminate his kidney stones without any pain! One reader shared that he was suffering excruciating pain from kidney stones. He knew it was due to kidney stones as he had a history of this problem. He had previously sought the conventional medical help to break down the kidney stones but pieces of the stone had gotten stuck in the ureter, causing severe pain. When he read how watermelon rind could help to break down kidney stones, he did not lose time and immediately got his wife to buy a big organic watermelon and had her juice the watermelon—flesh, seeds, rind and all. It made about one gallon of juice. He drank the watermelon juice over 12 hours. He was urinating many times throughout the day and at the end of the day, he went to bed with no more pain, and slept soundly through the night. Another reader shared that watermelon juice helped reduce his extreme pain. In his own words …. “I suffered with severe left-side back pain for several months. Thinking it was another kidney stone and after reading that watermelon RIND juice was good for kidney stones, I sectioned a watermelon, removed the pink flesh, peeled the dark green exterior of the melon, juiced the white rind with a low rpm juicer and drank it down. It wasn’t as tasty as juice from the melon’s red flesh but it wasn’t bad at all. Actually it was quite refreshing. The next morning I had ZERO pain. This happened several times until I finally went to my urologist who, after dousing my body with radiation, informed me I had NO kidney stone. THEN I went to my chiropractor who, after showing her where the pain was, put her finger on the exact vertebrae that was causing the ‘referred’ pain. After just one adjustment and one simple acupuncture treatment, I walked out without any problem whereas, when I first arrived, I could barely walk and had difficulty driving to her office. Related reading: How to reduce kidney stones calcification with magnesium. Among all fruits, watermelon has the highest amount of amino acid citrulline, a word derived from citrullus, a Latin word for watermelon. This compound is found in the highest concentration in the rind. The Journal of the Science of Food and Agriculture states that the citrulline in watermelon rind can fight free radical damage, and it can boost the immune system. Through my experience, I find that the rind contain nutrients that are powerful for cleansing the kidneys, even break down stones for easy elimination. Like the flesh of a watermelon, the rind is rich in mineralized water that helps the kidneys process waste more efficiently. Adequate hydration lowers blood pressure as well. Watermelon rind is also chock-full of vitamins C, B6, and A, and you can get a good amount of zinc and potassium from eating this part of the fruit. All of these vitamins and minerals can be found in just one serving of rind totaling 50 calories. Citrulline can aid in weight loss, and the fiber found in the watermelon rind can help you feel fuller for longer. Studies have shown that people who consume natural citrulline lose 30 percent more weight than those who do not. The lycopene in watermelon rind may be able to reduce the inflammation responsible for arthritis pain, and the folate in the rind may also lessen the risk of heart attack and colon cancer. Because watermelon is a god source of beta-carotene, it benefits eye health as well. Thanks to the blood and circulation-boosting powers of watermelon rind, drinking the juice may help men with mild to moderate erectile dysfunction. Its libido-boosting ability comes from the amino acid citrulline that is highly concentrated in the rind. The diuretic and hydrating properties of watermelon with its powerful cleansing abilities are beneficial for improving the functions of kidneys and for treating urinary tract infections. At the first sign of a UTI, start drinking freshly-extracted watermelon juice—flesh, seeds, rind and all—till symptoms are gone. If you have a history of UTI, drinking watermelon juice—in its entirety—regularly, might be a good idea. 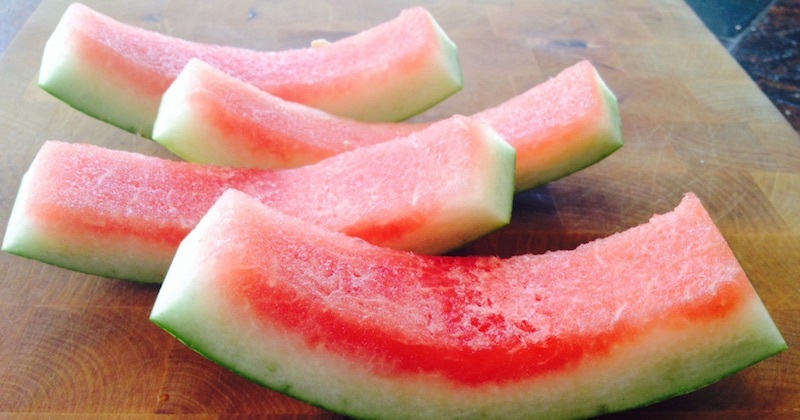 Pregnant women can take advantage of healthy watermelon rinds. Small portions of the rind can reduce heartburn, and it can reduce the swelling associated with pregnancy. The natural sugars can even reduce morning sickness! If you’re troubled by muscle cramps, try eating a little bit of watermelon rind to guard against future cramps. Due to its diuretic nature, drinking watermelon juice, and the RIND, can help to naturally lower high blood pressure. And, the beauty of it is that, even people with LOW blood pressure can benefit from drinking this juice as it regulates blood circulation and normalizes blood pressure! Using every part of the watermelon doesn’t just benefit your health. It can stretch your food dollars as well. You can make pickles using watermelon rind since it has the same consistency as a cucumber. If you have access to a juicer, you can juice the rind for a great-tasting drink that fights free radical cell damage. Make sure to buy only organic watermelon, and wash the outer skin completely for juicing. If you have a powerful blender, you may make this into a smoothie as well—flesh, seeds, rind and all.